The Lowy Institute's Michael Fullilove and Assistant Secretary of State Daniel Russel join the New York Times' Carol A. Giacomo to launch the U.S. Rebalance to Asia Symposium. Russel and Fullilove evaluate U.S. Asia policy, and consider the state of U.S.-China relations, U.S. alliances, and economic initiatives, including the Trans-Pacific Partnership. Fullilove notes that the rebalance has not proceeded according to the expectations set out in 2011, when the policy was announced. He suggests that the United States has found itself distracted by novel crises in the Middle East and Europe. Russel, meanwhile, highlights his experience leading U.S. diplomacy in the Asia-Pacific. He insists that U.S. partners and allies in the region constantly look for signals that the rebalance is on track. Over the course of the discussion, the two speakers address a range of other topics, including tensions in the East and South China Seas, the Asian Infrastructure Investment Bank (AIIB), North Korea, and the 2016 U.S. presidential elections. This meeting is part of the U.S. Rebalance to Asia Symposium, presented by the Council on Foreign Relations and the Lowy Institute for International Policy. This event was made possible by the generous support of longtime CFR Member Rita E. Hauser and the Hauser Foundation. HAUSER: Good evening, ladies and gentlemen. A pleasure to see you all. I'm Rita Hauser. And this is a singular event. Every year, our Hauser Foundation seeks to put on a wonderful symposium in conjunction with a sister organization, preferably some organization from abroad, but also from other cities in America, the idea being that we will get a different view, not just the council view, on a pertinent subject. And nothing could be more pertinent than the subject of the U.S. rebalance to Asia. ...helpful in getting it organized. Frank, I will tell you his story in two words. Frank survived the war in Europe, went to Palestine and from there to his adopted country, Australia, where he has been a singular success, one of the largest shopping mall builders, owners and operators in the world. And after reaching great success in business, Frank had the wonderful idea that Australia could use a good policy institute, so he came here and we took him around to different institutes in America so he could get a good idea of what we do and then he created a very singular one of his own. The focus of the Lowy Institute is global, but with a particular perspective from Asia. And they are really very qualified and very knowledgeable about their region. So it's a great pleasure to introduce the panel tonight. Michael Fullilove in the center is executive director of the Lowy Institute; Daniel Russel is assistant secretary of State for East Asian and Pacific affairs; and our presider tonight is Carol Giacomo of the Editorial Board of The New York Times, who has covered the diplomatic beat for a very long time. So I turn it over to Carol. GIACOMO: Welcome, everybody, council members and guests. Arguably, no issue is more important for the next half century than China and Asia and America's ability to manage its relationship in that region. I would say that exactly a year ago I was in Australia and the topic of several public appearances that I gave was, you know, what about the rebalance? That was a question then, it remains a question now. I'll leave it to you to decide whether it's a fair one or not. But it is on a lot of people's minds. So tonight let's start, Danny, why do you think this remains a question even now? Did the administration over-promise and under-deliver? Or are there other reasons why some people still seem to question whether this policy is actually—has legs? The sustainability of the rebalance is, I think, based on the fact that the rebalance itself is a policy that is driven by U.S. long-term national strategic interests. And it was clear when President Obama came into office amidst the dreadful recession in 2008, 2009 that America's long-term economic security rested in our engagement and active participation in the economic life of the Asia Pacific region. So this isn't a pivot in an abrupt or a transient sense, it's really a sustained engagement, a sustained investment. And the rebalance is aimed at ensuring that we're allocating the right amount of mind-share, senior leader time and attention, resources and engagement in a region that matters so much to the U.S. So I know it's fashionable to ask sort of whither the rebalance. I don't think that the metrics justify the question. President Obama has traveled again and again to Asia. He's hosted leader after leader. Former Secretary Clinton, current Secretary Kerry are constantly either on the road or on the phone with Asian counterparts. Just in 2015, President Obama, who visited the region twice last year, is going back to Southeast Asia, several stops. He's hosting at least four leaders in less than—just over a week actually, Prime Minister Abe of Japan will be here. Later in the year, President Park of Korea, President Jokowi of Indonesia, President Xi Jinping of China. There's a tremendous amount of high-level engagement. There's a tremendous amount of Cabinet-level engagement between Secretary Kerry, who's gone maybe nine times since taking office, Secretary Carter who's just back from Northeast Asia and is getting on his plane again to go to the Shangri-La dialogue. Secretary of Commerce Pritzker is out there now. Jeh Johnson, the secretary of Homeland Security, just back. There's an awful lot going on. And I think, Carol, frankly, that differentiating between crisis management, which is kind of all Middle East, all Ebola, all ISIL, and the sustained engagement and investment that we are making in the Asia Pacific region is a really important distinction. GIACOMO: But let me just follow up. People want to see concrete—I mean, I understand in an intellectual sense the need for engagement. People also want to see concrete results from that. There was a promise of rebalancing the military forces. This is a government that is in the midst of sequester and there are questions about whether it can deliver, you know, in terms of budget. There's a Trans-Pacific trade deal that is still hanging out there. And, you know, it seemed to make some progress last week, but there's still a question about whether you can close the deal. And we still seem to see a China that is growing more and more aggressive. So are you—is your rebalance a success or not? And I want Michael to weigh in on that as well. RUSSEL: Well, let me speak quickly and then turn it over to Michael. So you mentioned three things: security, economics and the relationship with China. The U.S. has five treaty allies and some very, very close security partners. Just among the allies, and let's put, unfortunately, Thailand off to the side because there are some real setbacks right now to democracy in the relationship that inhibit our defense cooperation, but with Japan, the Republic of Korea, with Australia and with the Philippines, within the last two years, we have or are about to roll out phenomenally important defense agreements that significantly enhance and really modernize our alliances, bringing them into the 21st century. This is not the Cold War alliance anymore. This isn't your father's and mother's alliance. We're really doing great things with our force posture arrangement with Australia—it's called the MAGTAF rotational deployment of Marines—with the recalibration of the transition of operational control and other agreements with the Republic of Korea, the incredible strides that we've taken with the Japanese. And we're on the cusp of rolling out, in connection with the visit of the prime minister, our revised defense guidelines. They haven't been revised in 17 years. These are going to be dramatic changes. And with the Philippines, we agreed on a really innovative defense cooperation agreement that's not about bases, it's about access and cooperation and training. So on the security side, I think there are very concrete and very dramatic steps forward. With regard to the economy, I mentioned just now Penny Pritzker, our secretary of Commerce, who, with the deputy secretary of Energy and a big group of investors and businesspeople, just combed China working on energy arrangements. We're apropos of the Chinese working on bilateral investment treaty we have been able to deal with and resolve serious problems about their application of anti-monopoly laws and even, most dramatically, in their banking regulations walked back some potentially very problematic rules pertaining to the Internet economy. TPP is making steady headway. We are within what I'd call grabbing distance of an agreement with the Japanese, and that's really the linchpin to closing. I think every leader and every trade minister among the 12 is determined to close on this deal this year. And it is really a very dramatic and impressive deal, not only in trade terms, but in environment and labor terms as well. And with regard to China, I think that the number of times that President Obama or Vice President Biden or Secretary Kerry or Hagel, Carter now, or other Cabinet secretaries have engaged with their counterparts—I should have mentioned Secretary of Treasury Lew was just in China at the end of March. The extent of their engagement is significant. And the results of that engagement are significant, whether it is an agreement to extend the validity of visas that enable businesspeople to go without encumbrance, that allow students to move more easily between the two countries, whether it is the really groundbreaking agreement on climate change in which the world's largest—two largest emitters and the largest developed country, and as the Chinese like to claim the largest developing country, agreed on really ambitious emissions target for post 2020 that is reshaping the way that countries are negotiating in the run-up to Paris. So I think we've got a lot to be proud of. GIACOMO: Michael, was this well-conceived? And do you see any positive outcome? FULLILOVE: Can I start first of all just by acknowledging a couple of people? Can I thank Rita Hauser in whose name we meet? I do want to mention Frank Lowy, my chairman, and David Lowy and Mark Ryan, a couple of board members. I should mention Richard Haass and Jim Lindsay who were good enough to invite us here to this magnificent American institution, the Council on Foreign Relations. And I also want to acknowledge Danny Russel and say to the Americans in the audience that you should rest assured that you have a very fine and thoughtful public servant in Danny who's very well-respected in the region. Now, having said that, I don't agree with absolutely everything Danny said. And you wouldn't expect me to, because Danny is implementing the rebalance and I'm paid to observe the rebalance. And I guess I would say this. I agree with the rationale of the rebalance. I think that a great proportion of your country's challenges and opportunities lie in our part of the world. This is where the largest economies are, this is where the most economic growth is going to come. This is where there are complicated security tensions. This is the region where America's only potential peer competitor lives. I was at President Obama's speech in Canberra in November 2011 and I paid credit to him at the time for the very clear conceptualization of the rebalance. I acknowledge some of the wins and advances that Danny has mentioned. And I also acknowledge that it's hard to pivot a country as large and unruly as the United States. The United States is the global superpower. You have global responsibilities. So no one would imagine or think that you're going to step back from those responsibilities. But has the rebalance gone as far or as fast as those of us who were in the audience in 2011 hoped for and expected? No, it hasn't. I take onboard all the achievements Danny mentioned, but I guess I'd make some points against them. I'd say that I wish that President Obama had made the case for the rebalance in a speech in the United States to Americans. I wish that he had mentioned the rebalance in the West Point speech, for example, on his foreign policy. We welcome when we get Secretary Kerry in our part of the world. We wish he was there more often. It's not just an executive issue. I wish the Congress was seized of Asia. But I don't detect a huge amount of interest in the Congress. I don't see the Congress rebalancing its interests towards Asia. I don't see the fourth estate pivoting with respect, Carol. I think this country is still overwhelmingly focused on other parts of the world. And as I say, those are important issues. No one's saying that the Iranian nuclear program or the black-flagged armies of the Islamic State aren't important to the United States. They are and they're important in my country and they're important to Asia. But when you add it all up, would any fair-minded reader of The New York Times over the last year or two, would any fair-minded observer of President Obama's speeches or any fair-minded observer of Secretary Kerry's travel schedule, would they say U.S. foreign policy has significantly rebalanced in the last four years, that it's significantly rebalancing? I don't think they would. I accept that this is a long-term issue, that the United States has to deal with both the urgent short-term issues and the long-term, important issues. But I worry that you're still too focused on the urgent and not focused enough on the important. GIACOMO: All right. But let me push you on this a little bit. You say you wish it had happened faster, sooner. What exactly do you want to happen faster, sooner? And when you say, you know, there isn't enough attention, I mean, I think Danny said that the president has been in Asia more than he's been in the Middle East, certainly in the last couple of years. So, you know, how would you restructure that? FULLILOVE: Well, let me make some concrete suggestions. I think any strategic doctrine that is worth its salt has to be argued at first at home. And a comprehensive case needs to be made for the rebalance at home. And yes, it's mentioned in official documents, but I would love to see the president and the administration—if the Asia Pacific is the big idea at the heart of Obama's foreign policy, I would like to hear him make that argument. I read a book, for example, on Franklin Roosevelt pivoting the United States outward and towards Asia in the lead-up to Pearl Harbor. And that didn't happen by accident, that happened because of a deluge of speeches and messages and decisions and missions and appointments and budget decisions. And for all the initiatives that Danny mentions, and I don't underrate them at all and I know how hard he and his team and his ambassadors in the region work, I don't think anyone could say that President Obama is carrying the country, that this is the big issue and he's making this argument. Secondly, I think that part of the rebalance has to be about strategic discipline. I mean, the definition of a rebalance, it seems to me, is doing less of one thing so you do more of the other. I mean, that's what a rebalance is. If you're rebalancing your stock portfolio, I think—although Frank is more expert than I—you're buying less of this kind of share and more of that kind of share. And so I guess I'm still waiting to see debates in the United States where, when it comes to the latest initiative or the latest deployment, people identify, locate that request in the hierarchy of American interest and say, well, we shouldn't be doing that because we need to give Danny more resources. And that's the third thing I'd suggest. I think the diplomatic element of the rebalance needs more help. I think there have been reports from the Senate Foreign Relations Committee and others to that extent. I think I'm on Danny's side on this. I'd like to see more development assistance and more heft put into the rebalance. RUSSEL: May I? Well, thanks. RUSSEL: We're in New York City and so every metaphor wants to go to Wall Street and I'll go there with Michael. I think that in the Asia-Pacific region, among certainly my counterparts and interlocutors, the assessment of the rebalance is very much like the way that we in the states look at the Dow Jones Industrial. People roll out of bed in the morning and check their iPhone and ask, sort of, how we doing? So there's a tremendous amount of angst. There's certain amount of hand-wringing. And there are people who need to be reassured and there are people who will never be convinced. But like the Dow Jones, it's an index made up of some categories. And Carol's identified a couple of those categories, the security basket, the economic basket. I'd add there's the values piece. This is something that Americans care about, what's happening in terms of democracy and human rights and legal institution-building, rule of law. There's also the range of soft power indicators, the exchanges, people-to-people, educational connections and so on. And on those indices, we're doing really well. Now, FDR needed to go to the people and make his pitch in a fireside chat because he was asking them to make a sacrifice. Obama is doing something different. He is showing people that jobs and wealth and stability come from our investment and our engagement in the East Asia Pacific region. You don't need to make that speech at West Point. You're not asking the American people to make a sacrifice, you're asking them to follow their interests. So the barometer isn't The New York Times coverage, all deference to Carol and The Times, the barometer is, what are we doing? Now, Michael, I would argue that it's been my experience that over the last two years that the U.S. has garnered tremendous credit from our engagement outside of the Asia Pacific region. The people that I know in Asia care that the U.S. is trying and that Secretary Kerry and the Obama administration put so much effort into the Middle East peace process. The people in the region care that the U.S. is dealing with the challenge of ISIL with Iraq, with Syria, with the refugees, with the Sunni/Shi'a divide. Michael, there are more Muslims living in East and South Asia than in the Middle East and Africa combined. Take Indonesia, the world's fourth-largest country, third-largest democracy, largest Muslim majority country, 40-some-odd percent of Indonesians—and we have former ambassador to Indonesia Cameron Hume here in the audience, he can attest—40-plus percent of the Indonesians are under the age of 25. What they know about the United States is not the old, non-aligned caricature, they know somebody like John F. Kerry going all at it in an effort to assist and to create peace and to work at it, successful or not. So in that respect, I would argue that the rebalance has now gone global. And the fact that we are engaged in crisis management is no more than what the world expects. The fact that we are enlisting Asians and the Asia Pacific in addressing challenges like pandemics like Ebola, challenges like climate change, challenges like violent extremism and ISIL, is an indicator of health. And that belongs on the Dow Jones. GIACOMO: All right. I'm going to jump in again. Obviously, the United States wants this policy to produce benefits for American policy. But we have seen China become more aggressive on the high seas, you know, building up specs of land into airstrips and outposts. The Chinese won big in their establishment of a new Asian development bank. What does that mean, and does it suggest that actually this policy is, you know, having a backlash really? Why don't you try it? FULLILOVE: Well, I mean, let me take the—let me take the financial metaphor and adjust it slightly. I mean, I tend to think that, you know, Asia is a very 19th century region. You know, Europe's a very 21st century region in the sense that it's—they thought perhaps before the last few years that they were beyond conflict, it was all about economic development. But in Asia you have strong states constantly assessing the will and the strength of each other. It's like there's a giant abacus in the capital of every state in Asia and they're constantly testing each other and sensing each other's will. And they're doing that very much in the cases of China and the United States. They're constantly comparing the two. I think, to me, the U.S.-China relationship is the most important bilateral relationship in the world. We know from history that the relationship between an established superpower and a rising superpower is very fraught. And for the United States, it's a very fine line to walk because the United States needs to show that it is in Asia in strength, that it's there to stay. It needs to project strength without belligerence. It needs to make its allies confident, but not make them overbearing or overconfident because overconfident allies can be troublesome. And it does it through this mix of engaging and hedging. And this is the same strategy that Australia follows, a similar strategy. And a lot of the countries around China are following it. But getting this balance between engaging and hedging, that is working with the Chinese when you can, but disagreeing with them when you must, is very difficult. You mentioned the Asian Infrastructure Investment Bank. I think this is one area where Washington, with respect, got the balance slightly wrong. I'm tough on China, but to me, the idea of China establishing an infrastructure investment bank, given that Asia needs more infrastructure spending, that was an opportunity to encourage China to see itself as a stakeholder, not to try to isolate China by getting other partners not to sign up with the Asian infrastructure bank. Now, whether it was wise or not as a policy it was unsuccessful because we know that most of the countries in the region have signed up. But getting that balance is incredibly difficult. Most of the powers around China, there is a kind of a natural balancing going on in Asia where a lot of the powers in China are troubled by some aspect of Chinese behavior. I mean, they're sort of naturally wary of this giant power in the region and they're somewhat unnerved by some of the phenomena you talk about, the facts that China is trying to create on the water the airstrips, the harbors, the buildings and so on. But that doesn't mean that they will always look at China as a threat, that they will always look at China through a strategic lens. I think all of us are working out, what is the balance between engaging with China and encouraging them to do the right thing, but at the same time standing up to them very clearly and very consistently on issues where we're troubled. And to me, that issue of the infrastructure investment bank might be one issue where Washington did a little bit too much hedging and not quite enough engaging. RUSSEL: Well, I think Michael makes a lot of very important points. It may be the time difference; I tend to think of the Asia Pacific region in the 21st, not in the 19th century. But apart from that, I'm in general agreement. The two instances that you cite are important ones, Carol. But we've got to think about them as they are. The issue of the South China Sea isn't about the rocks and the islands, it's about rules. It's about, what kind of country will China become as it grows, what are its intentions, what's the effect that it's having on its neighbors, and what are the tools that China is going to bring to solving the problems of the 21st century? I'd argue that what we're seeing from China in the South China Sea arguably is very 19th century and it's having a serious and I'd say a negative impact not only on China's relationship with its neighbors, but also creating pressures on the United States that put strains on the U.S.-China relationship and that also create a larger demand signal for an American security presence in order to deter coercion and to give the smaller littoral states some confidence that they're not going to be elbowed out of the way or bent to the will of a large power. But this is something that we talk to the Chinese about. This is something that we work closely with the ASEANs as well as the claimants about. We have a huge advantage. Number one, we don't have any claims there. We're not trying to acquire territory. Number two, we have a pretty good track record of, nigh on (ph) seven decades, as fundamentally a benign power that the countries in the region accept. They don't always agree with our decisions, but on balance they understand that we're not out to get them and we're not out to take something away from them. This is something, though, that is still very much a work in progress and the important thing is our ability to collectively communicate to the Chinese in a way that helps them understand what's really at stake as they make these decisions. On the AIIB, though, could I say that there's a storyline out there that the U.S. somehow dog in the manger set out to block China, and any bank because it was Chinese we're against it. I defy anyone to show me on the record a statement by one of my bosses or one of the senior U.S. government officials that backs that up. I've been back and looked through the record, you know, whether it was last fall when President Obama was in Beijing standing next to Xi Jinping and said we welcome China's contribution to international institutions, we want China to do more, we want China to do more in ways that are consistent with international law and rules, whether it was Jack Lew or the deputy secretary of Treasury or Josh Earnest at the White House, our statements have been along a single line, which is we want the new institutions, the new banking institutions to take as their starting point the high standards that have already been painstakingly developed by multilateral development banks. We want new members, new, prospective founding members, and Australia is one, to insist on high standards. We want to see the bank in operation, but we also want to see the ADB and the IMF and other development banks cooperate with the AIIB to help it get it right. This is not easy to do. So I think that it has been the messaging that we and others have done directly with the Chinese that has moved them in their conception of the AIIB a long way from the original formula which was kind of heavy on all will be revealed in time, just trust me, to where it is now with clearly written articles of agreement. They've made huge headway in terms of governance structure, in terms of oversight, in terms of standards. Sure, we think there's further to go, but we think it also is behind the explanation as to why a number of very responsible countries have decided to put their names in as prospective founding members. GIACOMO: We're going to open the questions to our members now. There's still a lot on the table that we haven't addressed, so I'm sure—sir? Oh, Dan. Hi, Dan. QUESTION: Thanks, Carol. Dan Rosen, the Rodium Group. Boy, I really am very uncomfortable with the Asian Infrastructure Investment Bank situation. I mean, I really have thought of it almost as a fiasco, from my opinion. But you guys have addressed it from—you've addressed it, Dan, from your perspective. But let me ask then this, Michael. What are some other norms in the international system which have not had an AIIB moment yet, but which could in the future that we need to concern ourselves with now? I think we're doing a good job of making as good a situation as we can around improving governance for AIIB. But there's other things. There's the trade regime and TPP. I'm thinking what would happen, what kind of a vacuum would be created if the U.S. was not about to follow through with what we started there? Are there other areas in the international system we should be concerned about, looking forward? FULLILOVE: Well, thank you. Look, I'd make a couple of points. I think first of all on the AIIB, I guess there was a decision to be made. Do you react to the governance problems that Danny mentioned by standing aside and saying, well, we don't want to be a part of that, we're not going to participate? Or do you jump in and say, well, we will participate, we think it's important that you're doing this, we haven't seen all the detail that we want to see, but we want to be in there contributing to the debate? And I think in the end almost every country or most countries in the region have made that second decision. I don't think that means that they've changed their view on the perfect, you know, on whether this is perfect. But I think they've made the decision I think it's a right decision that you're better to be inside the tent trying to influence it than outside. I would—you know, when you talk about other kinds of norms, I would, as I alluded to, I would clearly differentiate between moments when we should be engaging with the Chinese and moments when we should be telling them very clearly and consistently that we don't agree that that behavior is in the interests of the region or the world. You know, on the maritime issues that Danny mentioned, for example, Australia's taken a very clear-cut position on the ADIZ and on most of these maritime questions, and I think that's absolutely right. Because I think that on those sorts of issues I think we owe it to the Chinese to give them clarity and consistency in messaging, on those sorts of questions that go to peace and security of the region I think it's very important. But like I said, does that mean that every time an issue comes up in relation to China, every time China is trying to do something or advance an idea or a proposal that we revert to thinking about it in strategic terms? I don't think we can. I think China's too big a power to treat in that way. You have to get this complicated mix of engaging and hedging right. In terms of the TPP, it's great to hear from Danny that the administration is within grabbing distance of getting a deal with Japan. It was very reassuring to see the progress on TPA last week. But of course, now the real debate begins on TPP, and this is going to be a difficult debate because most of the opposition, as far as I can see as an outside observer, comes from the president's own party. And there are a lot of Democrats in the labor unions and liberals who are opposed to TPP. And we haven't yet seen, I don't think, what any of the presidential candidates have said on TPP. I don't believe that we've seen Secretary Clinton, for example, say much on TPP as a candidate. What sort of signal would it send if TPP failed to get done? A very, very grave signal, a very grave signal, because it is the centerpiece of the economic part of the rebalance. I think it would also send a bad signal if Obama were not to fight really hard for TPP. That will be interesting to see how hard the president fights for the Trans-Pacific Partnership, because to get back to the theme of the discussion he's got so many issues on. We understand that. He's got to persuade a lot of Republicans and a lot of people in Congress about the Iranian nuclear deal and other sorts of questions. So I think everybody in Asia will be watching very carefully to see how he approaches the debate and how the presidential candidates approach the debate and how the Congress approaches the debate, because we're in this for the long term. I mean, we want the rebalance to continue. We know that President Obama's only there for a couple more years. We need to be looking at the next administration. We need to be looking at the leadership on Capitol Hill to see if they're invested in the rebalance to the same extent that President Obama outlined in that speech in 2011. RUSSEL: I'm not going to touch on politics because I'm a career civil servant, but I will say that I've been blessed by a strong bipartisan support in the Congress for our Asia Pacific strategy. You know, I think your question was what are some of the other areas where we a la AIIB need to ensure that the Chinese are adhering to and working from international norms and standards. And I think there are quite a few that includes some of the new frontiers like space and particularly like the Internet economy and cyber where it behooves us and China to work together to try to find international standards and norms that are fair and sustainable and to do that in concert with other stakeholders. The institution-building, I think one of the signature accomplishments of the Obama administration was the decision to join the East Asia Summit and to actively and regularly participate in the meetings centered around ASEAN. Those, the G20, APEC, you know, the major emitters forums, there are a number of international fora and organizations, not to mention the U.N. Security Council, where the U.S. and China find themselves front and center as members, major members. And our ability to make common cause, to find ways to reconcile differences and to make progress often are the key to the organizations themselves really being able to get things done. On security and defense, we have in the U.S.-China forum a lot of progress on mil-to-mil, military-to-military, confidence-building measures. And on trade, I think TPP is significant to China, not because China is imminent as a candidate, but because TPP is really about high standards and defensible rules. GIACOMO: I know these issues are very complicated, but to try to get some more people involved in the debate, the gentleman in the third row, fourth row. QUESTION: Orville Schell from the Asia Society. Hi, Dan. If we look at what is happening in a place like Mischief Reef as a kind of a metaphor for China's assertiveness and if we believe in a rebalancing, which does imply a certain kind of a rebalancing of the power relationship, and if we have protested that we find this dangerous, counterproductive to the relationship, and if nothing happens and the runway keeps on getting built, et cetera, what is the next response? RUSSEL: China should be working to build common ground, not working to build artificial ground, right? The issue isn't rocks and shoals and submerged reefs, it's not outposts. They can build an airstrip, they can build a port. They can fill, as they are, hundreds and hundreds of acres of landfill in the South China Sea at, I should mention, great cost to the environment. But what are they getting? Their arguments, which I think don't hold up terribly well under testing, are that this is about providing good accommodations to people on uninhabited islands, it's about creating space for fishermen wherein overfishing and illegal fishing are exactly among the big problems that the South China Sea faces. What we're doing is, number one, talking to the Chinese directly at authoritative levels, from President Xi Jinping on down, making clear that for us the issue isn't the validity or the quality of China's territorial claims, although we do wish all of the claimants would define their claims in ways that are consistent with international law, it's about behavior. And the net effect, which is the second point, of China's behavior is to alienate, frighten and alarm the countries in Southeast Asia. And as I mentioned earlier, that's bad for us. We want China to have good, healthy and stable relations. The third element is the maintenance of our very credible and very significant military capability in the Asia Pacific region. This is something that we continue to invest in, that as the former and the current defense secretary have attested continues to develop. This is, for the purpose as our alliances are, for the purpose of keeping the peace, not waging war. And in keeping the peace and in maintaining stability, we're creating an environment in which the only acceptable recourse for China and for its neighbors is diplomacy and where diplomacy isn't getting to resolution of the legitimate recourse to international arbitration such as is under way in the tribunal in The Hague. GIACOMO: Gentleman over here, please. QUESTION: Hi. Juan Ocampo, Trajectory Asset Management. Michael, I've got a question for you. Xi Jinping has a pretty ambitious agenda, I think we can all agree, and part of that is to, you know, try and extend the supremacy of the communist party there for as long as the eye can see. AS long as things go well for him, maybe that works. But if things get unpopular economically or some other way, let's assume that happens internally within China, what do you think is the most likely area that he might strike out at or China using him to try and create the kind of internal support within his country, much like Putin did with Crimea, you know, where that actually worked very well for him in terms of popular support inside? So if there's a very unpopular bad event, economic turn there, what's kind of the downside and where does it happen? FULLILOVE: It's interesting you mention that example. I mean, some of you will have read a really excellent biographical piece on Xi Jinping in the New Yorker a couple of weeks ago by Evan Osnos. And he has a really interesting point in there where he says, based on pretty good sources it seems, that Xi Jinping was really impressed by Vladimir Putin's takeover of Crimea and basically said, look, this guy's done a great deal, he's got all those resources and he's improved his poll numbers at home. And that's interesting because for years I've been dealing with Chinese interlocutors and they've always told me that at the very center of Chinese foreign policy are the principles of noninterference in other countries' territory and state sovereignty. So it's really interesting that Xi Jinping, at least in that reporting, was admiring of the annexation of Crimea, although Osnos then says that he's been less impressed with Putin's ability to close the deal. I think your question raises a really important question, a really important issue, and that is, what will the internal frailties in China, how will they be manifested in China's external behavior? Because there are many internal frailties and they're almost as worrying as the strengths. If you think about the rampant corruption in China, which Xi Jinping is apparently trying to deal with with the punishment, I think something like 100,000 officials in the Chinese communist party in the last year, if you think of unrest in certain regions, if you think of the economic slowdown in China, admittedly off a very high base, but what happens if that goes pear-shaped and the Chinese communist party can't maintain the economic growth that it needs to legitimize the regime, to maintain regime continuity? What if those issues start to cause problems for Xi Jinping? What if the corruption crusade starts to cause difficulty for him internally among other senior leaders in the Chinese communist party? And the answer is we know that nationalism is strong in China. We know in this year, the 70th anniversary of the end of the Second World War, that throughout the region history is important to people, people are living history, that they're still living the history of the Second World War in a way that I don't think that they're doing in Europe even after the shenanigans after last year, I think there's a lot of potential for difficulties. It's been great to see in the last few months the China-Japan relationship stabilize, but it wouldn't take much to complicate that relationship again. So this is one of the things that worries me. Almost as much as China's strength, I am worried about China's internal weaknesses and how that might manifest in terms of China's external behavior. GIACOMO: Gentleman there, please. Oh, and then the woman behind him. No, the gentleman and then the woman behind him. QUESTION: Thank you. My name is Olin Wethington. I have a question for Assistant Secretary Russel, please. China and the U.S. both have the objective of denuclearization of the Korean Peninsula, but North Korea's development continues apace and there's a sense that this is not a top priority issue for the administration. Question to you is, how would you characterize the urgency of this situation? And what is the potential for U.S.-China cooperation to bring North Korea back to the standards they had agreed to some years ago, including the NPT? Thank you. RUSSEL: Thank you. This is an issue of tremendous salience to the U.S. government and to our national security. It's something that I know firsthand President Obama, the vice president, the national security adviser, the secretary and other Cabinet officials, as well as myself, are very focused on and work hard on. It will require some level of cooperation from the North Koreans for there to be the kind of negotiations that are essential to a peaceful resolution of the North Korean nuclear and missile program. There are other paths to resolution that are pretty messy. But to get a peaceful resolution, we need to negotiate. North Korea is, thus far, unwilling to negotiate The Chinese, who have tremendous leverage over North Korea, also have tremendous fears of a messy implosion or collapse. And they're very direct with us in saying that they're looking for a middle ground that maintains pressure sufficient to convince Kim Jong-un that, as hopefully the supreme leader in Iran is concluding, that this nuclear path is a dead end, but that there is an alternative path that will lead to not only sanctions relief, but also normalization and the wholesale improvement of relations, which will in turn lead to real regime stability. Now, in the meantime, since the one thing we can't control is Kim Jong-un's decision-making, what we can control is some of the environment that can shape that. We are working very closely with the Chinese, but from the base of trilateral cooperation with Japan and the ROK to try to sharpen the choice for Jim Jong-un and reduce the options to allow him to have his cake, a nuclear program, and eat it, too, to be able to provide the wherewithal that any authoritarian dictatorship needs in order to maintain regime loyalty and stability. It is very much on our minds. It's very high on our agenda. And pending success in bringing North Korea to meaningful negotiations that have a chance of getting back to and implementing the commitments that North Korea already made, we're maintaining strong, allied unity, close coordination with China and, I dare say, even with Russia. But we're also maintaining very strong deterrence. GIACOMO: There's a woman about halfway down on the right side. And I'll take this gentleman as well. And we'll take both of them and then we have to wrap up at 7. QUESTION: Great. Angie Tang with The Diplomat magazine. Hugh White last week made an analysis of two reports, one is a CFR report that we have been given, one is from Kevin Rudd of the Asia Society. And his analysis was that there's an unraveling of U.S. consensus on China, which we've been discussing today. 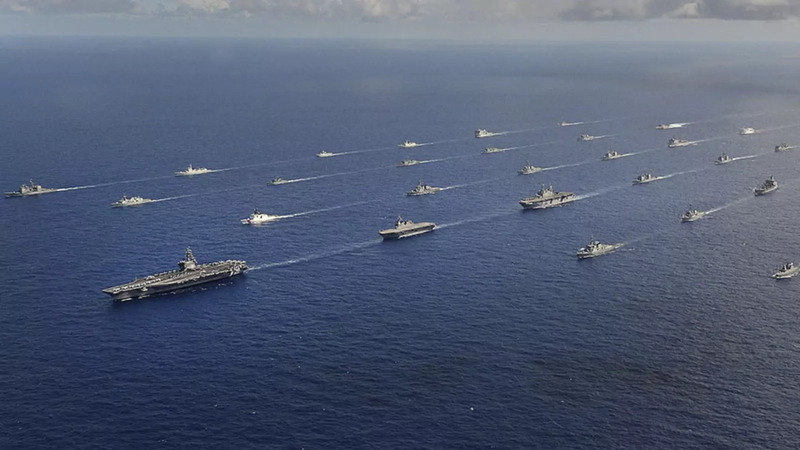 And his assumptions are that, one, that the U.S.-China rivalry is escalating; and two, that Washington so far has been assuming that Beijing is not going to act and not going to want any military conflict. So how would you, Michael, assess the next administration? Do you feel that these assumptions would hold? And if so, how would that change Washington's calculus in managing this rivalry? And please, Danny Russel, you may also, please, respond to that. GIACOMO: OK. We've got 10 minutes more and I'm going to take this other question as well, please. QUESTION: Dr. Fullilove, could you tell us what the principal points of disagreement or significant differences between the Australian government's view of China and the U.S. government view of China? And the same question in regard to your views and Mr. Rudd's views of China? GIACOMO: OK. This is going to test both of you because we've got 10 minutes, but go at it. RUSSEL: This is Fullilove versus Hugh White and Kevin Rudd. That sounds like a rugby match to me. FULLILOVE: Bring it on. Bring it on. Look, I'll try to be quick and give Danny an opportunity to talk, too. First of all, on Hugh White, Hugh White's a wonderful friend of mine. He's a great Australian analyst of strategic issues. Hugh and I disagree. Hugh thinks that Australia should be trying to persuade the United States to step back in Asia to afford strategic space to China. And I don't think international relations works like that. I don't think there's going to be a grand international meeting at which these things are decided. I think China and the United States—and the other states in Asia will play their part—will test each other in coming decades and will feel each other out. And I think the best way to ensure a balance of forces in the region is for the United States to double down, not to step back. The second question was about the next administration. I raised that earlier because that matters, doesn't it? If this is a rebalance for the ages, then we need to be hearing from the candidates for president that they're committed to the rebalance. My sense is that is Secretary Clinton were elected president I think that's good news for supporters of the rebalance. The reason I say that is, to me, that's the biggest achievement of her time as secretary of state. It's her biggest area of legacy. Some of the people around her are very committed to the rebalance. So I think that's all to the good. I haven't heard many of the Republicans talk about the rebalance, many of the possible Republican candidates, but we'll have to see. And I'd urge the questioner to put that question to those candidates and I'd urge the fourth estate to put those questions to the candidates, too, and not allow them simply to go back to the tried-and-true issues, but to ask them also about the rebalance. The final thing, I guess the final point I would make, I mean, in relation to those two reports that you mentioned, I'm probably closer to the Rudd report than I am to the Council on Foreign Relations report, with all due respect to Jim Lindsay. But I guess I would say this is the Fullilove view, if I can finish on this point. I don't want anybody to get the wrong impression from what I've said. I am a supporter of the rebalance. I am an optimist about America and about America's presence in Asia. And when people talk about China's strengths, I often think to myself I bet that Xi Jinping wishes that China were as weak as the United States, because for all of China's strengths, America has enormous enduring strengths. But I'm impatient about the rebalance. And yes, I know this is a long-term issue. But to me, it is not changing fast enough. And so I'm impatient for the rebalance. So that's the Fullilove love to put aside the White and Rudd views. GIACOMO: Danny, you have about five minutes. RUSSEL: Well, I won't take five minutes. When I want to know what the Chinese or other agents think, I ask them. When I want to know what the Republicans think, I ask them, too. And I've heard no-less-a-distinguished Republican and statesman and foreign policy expert Henry Kissinger declare that he fundamentally agrees with the broad outlines of the U.S. policy towards China. I think that when you look at what Hank Paulson did, when you look at what previous Republican administrations did, you find many, many points of commonality. I think that's the basis of a lot of bipartisan consensus, not only on a one China policy and Taiwan Relations Act, but also with respect to the rebalance. I think that it's important, however, to look carefully at the question of whether or not the issue of China becomes an issue in the 2016 presidential campaign. That's a very different issue. And it is important, I think, for the Chinese as well to recognize that the decisions and the actions that they take, both in terms of the U.S. bilateral relationship, in terms of their behavior in the region and on the global stage, have the potential to generate alarm that could, in a political season, trigger a kind of politics of China that neither they nor any administration wants to see. Lastly, I would say to Michael that, trust me, I have no objection to you and others urging the U.S. to do more and the Congress to be more liberal in the funding of the programs. Although I am pleased to say, and I'm going to be testifying on the budget on Thursday to the House, that in the FY '16 budget we're seeing a 4-plus percent increase in our foreign assistance in the Asia Pacific region. But we'll take more if we can get it. GIACOMO: Well, thank you, everyone, for coming. The questions were good, as usual. We'll see.